Hola! I am feeling much better today although my throat still feels a little funny and I am sticking to my warm water and hot drinks for now. I hope you are enjoying your Christmas break much as I am enjoying my time with B and in case you're wondering, yes I am still on my Blockbuster Diet! My darling is also feeling a little under the weather actually so right now, it doesn't seem like much of a holiday for us. Aside from watching TV and catching up on sleep, we have yet to do the usual things we love to do on holidays like checking in to a nice hotel in the city centre. To be fair, B did attempt to secure us a nice suite for our 5-day weekend but as usual when you call too late, all the good rooms are taken up especially during this festive season. I was expecting a relaxing stay in a spacious suite with a luxurious Jacuzzi Whirlpool but obviously that's not happening. Speaking of which, I've never tried bathing or soaking in a Jacuzzi Whirlpool, have you? I told B that our next home will definitely have a Jacuzzi Whirlpool in the Master Bath. He is always having aches and pains everywhere and usually I'd send him off for a massage. Physically, Whirlpoolbaths will do wonders to ease the pain of aching muscles and joints. Warm water combined with the massage like bubbling of the jets will help relax tense muscles whilst improving your blood circulation; and this in turn, will help enhance your general health. 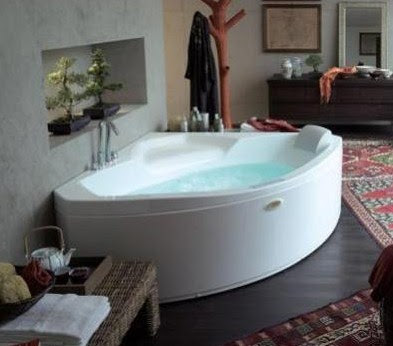 Emotionally, pampering in a luxurious bath in a Jacuzzi Whirlpool tub is an excellent way to unwind and relax. I'd light up a few scented candles of course, sprinkle some yummy Raspberry bath salt into my bath and perhaps listen to some relaxing music before I surrender to the sweet luxury of a comfy massaging bubble bath. It all sounds so heavenly I am now doubly sorry we did NOT book our hotel suite earlier! :* :* :* :* :* :* He he Hey LJ! Hope you and B get well soon dearie.. am still to and fro ILs place but guess what.. mama can now sit up by her own.. not for long but at least a start right? will update LLP in a while! Yeap GP.. awesome indeed.. this morning she was sitting and things and then tonight she wants a walker so hopefully she’ll be walking in no time..
Mmg penat. The kids pun cian.. tak dapat kluar from their room..sigh.. I also got work to do ni.. lucky for P1..
Now u got P1 at home and at MIL’s?? Marzie, get well soon dear. You really need some rest . Merry Christmas ! Hello! Kesian nya, dua2 sakit ke? Relax sikit lah, I think you both are working too hard. But compared to me you guys are lucky, just shukur2 banyak, at least you have your B and only 3 cats. So enjoy lah sikit... next time book hotet earlier tau. I've learned from my late mum kalauyou have sorer throat, beli "getah anggur" or "semang semangkok" di kedai India, rendam nya, dah kembang, boleh campur ayer dan sedikit gula dan minum. You tau, you biasa dak mimuman China "Lycee Kang" they called, dlm tu also di masukan bahan2 ini, good for the throat! Cuba lah! I pula dah dgn jaga now altog. 34 cats selepas gave away, you tau Al hamdullilah semua yg kenal I hairan tak deman2 tak sakit2 dah pun 3 tahun lebeh, tapi itu lah I dok amal kan minum the Lifestyles product, 23 herbals tu yg di namakan "intra", even my sis's grand children sakit, my sis, kalau nak bagi tahu, memang all of them lah kadang2 I denger pi Klinik and mereka ni dok hairan I ni tak sakit pula! Itu lah yg I amalkan, in fact, memang pun I have to take good care of myself because I really do not have anybody yg betul2 care for me, I am my own hero! I biasa juga soaked myself dlm Jacuzzi, when I was on holidaying in Pulau Tioman. Love it, very relaxing. Now I really got to pick up bits and pieces to mend my life back to normal again. So Marzia & B, take good care of yourself, ok? Hope you both cepat sembuh. My hugzzz to you & all your Meow, Meow cats. Come join us at Eastin for new year! sad to hear about that but as long as you and B are together during the holidays it's all ok right?